I am not sure how I am going to quilt this yet, so I will probably put this aside for a week or two while I work on some smaller projects. I have passed the 100 followers mark! I started this blog a few months ago because I love the online quilting community and I wanted to find a way to become more a part of it. It has been very fulfilling to be able to talk about quilting in a forum where people have the same interests (my husband will listen, but he does not share my love of quilting!). To celebrate passing the 100 follower mark, I wanted to do a little giveaway. I have been holding onto this beautiful Echo charm pack and I want to share it with one of you. 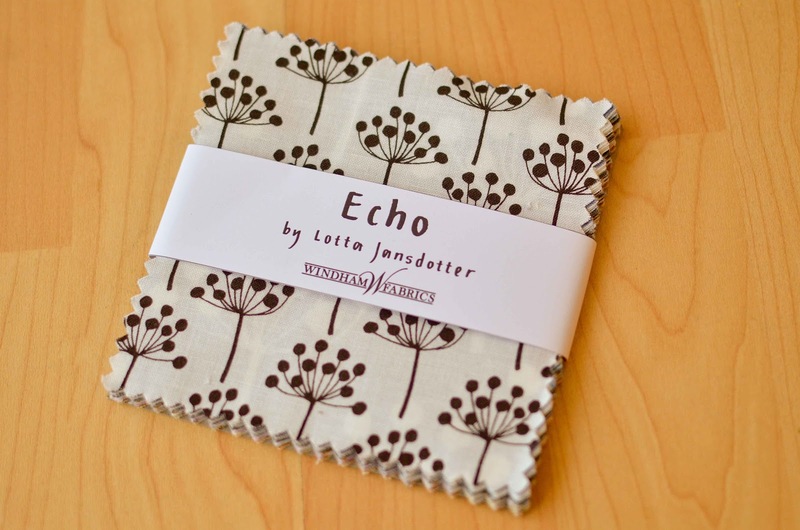 It contains a 5 inch square of each print from Lotta Jansdotter's Echo line. If you would like to be entered in the giveaway, just leave me a comment. You can tell me something interesting about yourself, something that you are looking forward to, or whatever you want. I will pick a winner on Sunday evening. I love your version of this quilt! Seeing it I initially thought it was a shower curtain, even though the quilt's been all over bloggyland. Maybe I should make one for that purpose?? ;) Congrats on reaching 100 and thank you for the chance to win such a lovely prize! I love the colors you used, it looks great. I have yet to begin mine! Congrats on 100 followers - nice giveaway, thanks!! Wow, I love those colours on your Groove quilt! My favourite giveaway ever! Cannot believe you have finished piecing the totally groovy QAL in one afternoon! 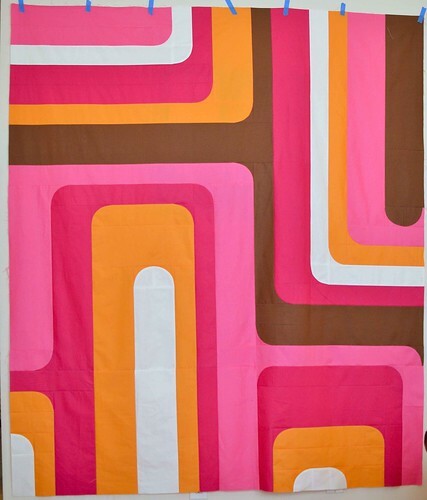 love the colors on your groovy quilt! how easy was it to put together? it looks great! Congratulations on the milestone and the piecing. I'm looking forward to the birth of my first niece - she was due today but is apparently going to be late. At least she wasn't early though, so I had time to finish the quilt I made for her and deliver it to my heavily pregnant sister ready and waiting! Congratulations on the finished groovy top, and on reaching 100 followers! I remember when I was there, which wasn't really too long ago, I really wondered who all these people are that want to see my stuff! And before you know it, you'll surpass 200. :) Thanks for the giveaway, I'd love to win that charm pack. I can't wait to see how you quilt this! The colors are so wonderful and cheery! 'm a recent cotton couture solids convert (I used to be a Kona only girl). Thanks for the giveaway! Love your groove quilt. I haven't tried curves since the color wheel era, that took a lot out of me! What a lovely quilt! Oh and something about me-- I'm looking forward to (and a little nervous about) putting together my first tutorial! wow, you are FAR! 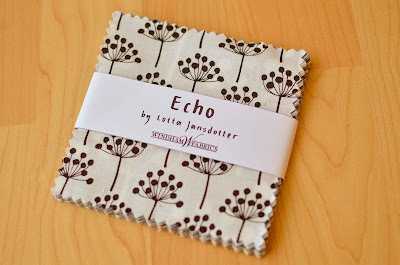 i haven't even ordered my fabric yet - though at least i finally chose it :) and i'd love to win the lotta! I love both the colors and design of your quilt. Great job! Yikes you have surpassed me :) I'm feeling behind haha it looks great! Such a great quilt top! I want to make it but am afraid of curves. Oh, I am so jealous! Your totally groovy quilt looks amazing! I haven't even started cutting mine yet. Congrats on reaching so many followers! You finished your Groove top so quickly and it looks amazing! I'm just getting started on a new quilt for our bed now (lots of light blues paired with white). Hopefully it will come together quickly too! That's so sweet of you to do a giveaway! I never picked up any Bella and have kind of been kicking myself for it. I love your groovy quilt, the combo is perfect - really, my parents had a rug from the 60 s in those exact shades. I wish I had it now but it was wrecked when their basement flooded. I don't think my mum exactly misses it, but it's probably a good thing because I know my sister and I would be fighting over it! Whoops, that would be echo that I never bought, Bella isn't out yet! congratulations on 100! Your quilt top is beautiful, just don't make me do any part of it when it is your do.good stitches turn to pick the block....curves scare me! Something about me: I have decided that I am going to REALLY try to actually finish a quilt by the end of this year. I have made lots of blocks (which I thankfully get to give away) and two quilt tops but have never finished an entire quilt, of any size. Wish me luck! Your quilt is going to be fantastic! I really like the colors you chose. I am actually looking forward to the fall and especially some cooler, rainy days. :) Congrats on this milestone and here's to many more! Super groovy quilt! I've been working on a cathedral window. I like the traditional look mixed with modern fabrics. great quilt! i may need to add this pattern to my wish list. i'm excited because i just noticed i hit to 10 follower mark! 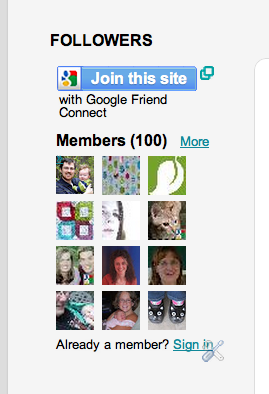 (no where near 100, but still exciting)! Love the palette of your quilt! They seemed to go together quick! Love Echo & never really got much - would love that charm pack! Congrats on 100!! Congratulations on your 100 followers and wow...you're fast! I haven't finish cutting into my fabrics yet! Your groove quilt looksfantastic and love those colors you chose. Happy Triple Digits. Your Groovy quilt is amazing in those colors. Every time I see that pattern I hear Austin Powers in my head saying "groovy baby", never fails. Congratulations on reaching 100 followers! Love your Groove quilt, the colours are amazing. I'm just about to start quilting again after an enforced lay off due to hand surgery. My frustration at not being able to sew was made bearable by being able to get my quilting 'fix' from the quilting blogs that I follow, so thanks! Your groovy quilt looks amazing. Great colors. Thanks for linking up with WIP Wednesday. I just found you and enjoyed looking over you blog. Beautiful work! Love your pink colour palette, it looks like candy! I haven't started my groove quilt yet, the fabric just arrived today, but I look forward to digging in on the weekend.